Medicinal uses: Comfrey has been used in the past to treat stomach ulcers, irritable bowel syndrome, and a range of respiratory conditions, including bronchitis and pleurisy. Promotes the healing of bruises, sprains, fractures, and broken bones. It encourages ligaments and bones to knit firmly together firmly. A comfrey compress applied immediately to a sprained ankle can significantly reduce the severity of the injury. The combinations of tannins and mucilage helps to soothe bruises and scrapes. 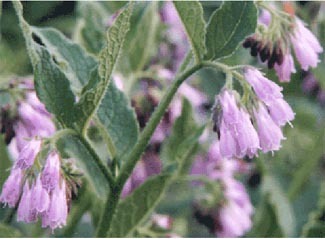 Comfrey oil or ointment can be used to treat acne and boils and to relieve psoriasis. It is also valuable in the treatment of scars (Chevallier 137). Additional uses: The leaves of comfrey produce a brown dye in wool mordanted with iron (Kowalchik 105). Cautions: Pyrrolizidine alkaloids have been found to be highly toxic in the liver. The substance has been found in higher concentrations of the root than in any other part of the plant. Many recommend that this plant not be taken internally except under professional supervision. It should also not be applied externally to open or dirty wounds as the healing process can occur quickly trapping debris and pus. Do not use if pregnant or nursing (Chevallier 137).